Spray 5-quart slow cooker with cooking spray. Rub pork with salt and pepper. In 12-inch skillet, melt butter over medium heat; cook pork in butter 2 to 4 minutes on each side or until browned. 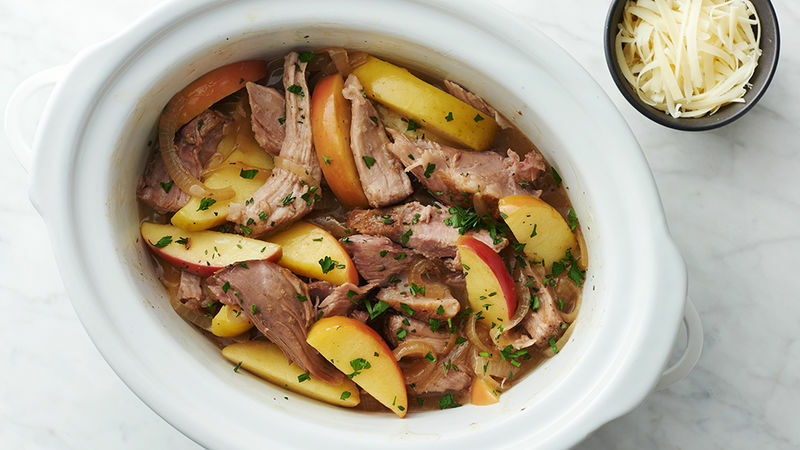 Transfer pork to slow cooker. In large bowl, beat broth, maple syrup and mustard with whisk. Stir in onions. Pour mixture over pork. Cover; cook on Low heat setting 7 to 9 hours or until pork is tender. Carefully transfer pork to cutting board; let stand about 5 minutes or until cool enough to handle. Shred pork, discarding any pieces of fat and cartilage. Meanwhile, add apple to slow cooker. In small bowl, beat cornstarch and vinegar with whisk; stir into liquid in slow cooker. Cover; cook on High heat setting 10 to 15 minutes or until liquid thickens. Stir in pork; heat through. Serve pork topped with parsley, thyme leaves and cheese, if desired. Remember to trim the fat from the pork. Some fat is fine, but large pieces of fat left on the outside of the pork will make the sauce greasy. Try serving this easy dinner with Betty Crocker™ roasted garlic mashed potatoes.